Just one of the many toxic substances showing up in well water, ground water, soil, and air in high quantities, Barium is a silvery-white metal that combines with other chemical compounds to form toxic barium compounds. Although this substance is also a secondary product from the oil and gas industry, and used to make drilling muds, it is also used in aerosol chemtrail spraying – a controversial topic. 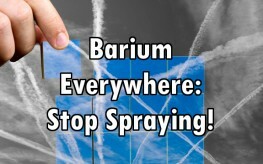 Barium has been found in samples at six times (or more) the level that the EPA finds safe. Numerous samples taken from around the country contain barium oxide, an ionized metallic salt in places it simply shouldn’t be – especially our drinking water. Atmospheric samples collected by Clifford E. Carnicom in Santa Fe, New Mexico showed unsafe levels comparing them to an advisory from the FDA. The maximum allowable limit for human exposure to barium atmospheric contaminants is 0.5 ppm, and Carnicom measured levels which exceeded this limit by 8 times. This phenomenon is real. Ex military scientist, Kristen Meghan has gone above and beyond her duty to the citizens of this country, explaining what she found while she was enlisted. You can watch her speak on chemtrails, including the use of barium here. It is no different than the spraying of Agent Orange in Operation Ranch Hand in the 1960s and 1970s – and guess who made that toxic substance? Monsanto was one of nine wartime contractors who helped poison US soldiers and the Vietnamese. You can’t argue with samples taken from experts and citizens all over the world. 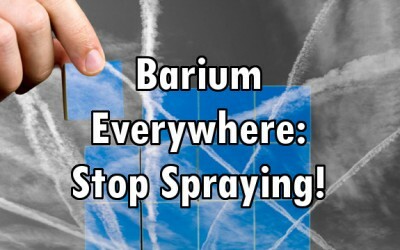 We are being sprayed with barium salts. Who is behind all this is another question, but what can you do about it? You can start to detox your body from these and other poisons, and get vocal about it. All great changes start from grass-roots awareness. 9,660 letters have already been sent to Congress about this matter. Add yours. I have a blood pressure monitor. I can tell when the sky is being sprayed with barium. My blood pressure jumps an alarming 25 points. This does not make me a happy camper. I have written to my representative, sent pictures, asked him to get the spraying the spraying stopped. His response: “Well it looks like someone missed with crop dusting. There are no crops nearby to dust! I showed him the spray faning out into a contiuous cloud cover. He said that’s a contrail. I wrote back and told him he is part of the problem, not the solution. He relented a little, but as far as I know, did nothing. That was Jeff Merkley’s staff member. That’s for Oregon. I guess they’re fine with their constituents being murdered. they want to kill us so we can say stop but they won’t. sad but true. Excellent article exposing the gubmint poisoning of the people, animals, crops, water, air etc.. by air. CorpoRATe, Gubmint owned lamestream media reports NOTHING, as usual. Chemtrails have been shown to contain mercury, aluminum, lead, arsenic, mycoplasma (bacteria), and MOLD spores, in addition to barium or barium salts. Do a search for HAARP, Geo-engineering (gubmint induced fake climate change) or just plain air crap and learn more. One of the best sites to learn truth on chemtrails is Carnicom, referenced in this article. Oh please. Poor old benighted HAARP was discontinued in the spring of 2013. As for the content of your supposed chemtrails, please provide a link to the laboratory that reported these findings. Animals and plants are dying? Let’s point the finger of blame in the right direction: GMOs and climate change. Gmo’s are also to blame, but that does not disprove man made climate change by harp like tech. and chemtrails. Also how do you know haarp was shut down? Because the government claimed to shut it down? After denying its very existence for years, calling it crazy conspiracy. Then they come out and say ” OK, its real, but it can’t change the weather and we are stopping the project anyways”. And you simply trust them to actually shut down their top secret project just because they say they are going to? Just because they shut down the facility in Alaska, doesn’t mean they didn’t have another site set up elsewhere. Also what does this government have to say about gmo’s? Oh, that’s right. They day they are perfectly safe and can be labeled as “all natural”. You know they are not safe or natural, making the government liars, yet you believe them when it comes to haarp and chemtrails? HAARP exposed..under the DIABOLICAL DARPA gubmint program. Easy search, numerous articles. Get out of your basement for a minute and go outside and LOOK UP, stinking Troll. “provide a link to the laboratory that reported these findings”. ?.’oh please’..try reading the article and references, idiot…FAIL! Do you think just because they said they closed HAARP they actual did???? OMG!!!!! LOLllllll Do your own research. ALLLLLL the information is available on line. But even with ALLLL the information, some people can not handle the TRUTH! Very disappointed in this story. Natural Society has a reputation for science-based research and reliability. Jumping on the chemtrail conspiracy bandwagon has shaken my trust in you. Please, stay away from the sensational and stick with authentic health issues. Hey “islander2010” Go troll somewhere else you fricking IDIOT, people are on to you and your Bull Sh*t posts that “NOTHING is HAPPENING”, There should be a law passed that no one with an IQ below 25 can post on the internet! Name-calling: the last resort of a failed argument. Aluminum is another one of the reported elements being sprayed. It has been linked to Alzheimers. Nothing is being sprayed. Aluminum is the most plentiful element on earth; you will find it everywhere — in the air, in the water, on the ground— naturally. The purported link to Alzheimer’s is shaky, whereas the link of modern wheat to AD is on much more solid ground. Incredible but makes a lot of sense. Something big is coming and what you’ve reported is very interesting indeed. This government is the most corrupt in the world IMHO. I want out of here. I’m sure Russia, China and others are well aware of what the USSofA has been up to. They’re ready but US is not. MSM detoxes aluminum from the brain. What about the loss of sunshine? Can you make up a good point for that?!!!! it’s called SCIENCE. The curious thing about scientific method is that hypotheses can be falsified. it is laughably easy to falsify chemtrail hypotheses. I could list some sites for you but I doubt they’d change their attitude. Our eyes are deceiving us because some “scientist” says the “science” shows that the trails behind the planes are just contrail, made from water evaporating from the engines. This is of course ridiculous and very laughable. There is a new video uploaded on YouTube recently, it showed a plane landing. Only one problem, it forgot to turn off the sprayers! But have no fear the “science” is not there and they are not spraying anything. Nice sarcasm there josh! lol! Aluminum creates swelling wherever it ends up inside the body. It can also pass the blood brain barrier and enter the brain. Guess what it does there… It creates swelling, which leads to not so great things, like alzheimer’s. Also the fact that you are trying to use the fact that aluminum is “everywhere”, and is not a known neurotoxin, to somehow prove that they are not spraying chemicals into the air, is a pretty blatant troll tactic. NOTHING is being sprayed???? LOOK IT UP!!!! Correct. Numerous articles report that one who takes six flu shots in six years is guaranteed Alzheimer’s due to the excessive aluminum in the vaccines. Adding to vaccines, the chemtrails are ensuring the people, animals, plants, water, earth and air are LOADED! Government ‘for the people’? WAKE UP AMERICA!